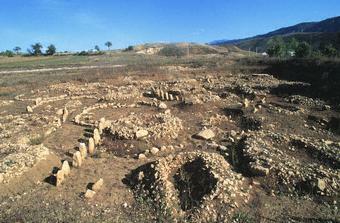 An extremely interesting site, Fossa, in Abruzzo, was used by the ancient Vestini tribe as a cemetery during the early Iron age (1000 - 800 BC). The stones - mostly upright flat slabs between 0.5m and 4m (1.6 and 13 feet) tall - are arranged in circles and straight lines, but with the unusual feature that in many of these circles and lines the slabs are of radically different heights and are arranged, like the steps of a staircase, in order of height. Those slabs that are set in straight lines (usually between six and eight slabs in a row) may have had some horological or astronomical significance, as they are aligned E-W. The tombs inside the circles were used for single burials and the bodies were oriented, like the slabs, E-W. Besides their human contents, the tombs also contain pottery, bronze vases, weapons and ornaments. Tomb 19 contained a jar decorated with geometical motifs made by the application of metallic flakes. Some of the later burials used the hollowed trunk of a tree as a coffin.